Time to get that 90s Raiders jacket out of the attic. IT SOUNDS LIKE Jon Gruden is really coming back to coaching this time and it will happen with a team he is quite familiar with, the Oakland Raiders. The Raiders fired head coach Jack Del Rio on Sunday after the team finished a disappointing 6-10. According to NFL insider Adam Schefter of ESPN, Gruden will be the next head coach of the Oakland Raiders. While the deal is not official yet, Schefter, along with Chris Mortensen, reported that the Raiders planned to aggressively pursue Gruden. According to their sources, Gruden would be “tempted to accept” the offer and that it could even include an ownership stake in the team. It should also be noted that Gruden currently works for ESPN and presumably Schefter would not make such a proclamation without some assurance that his statement was accurate. Email “It looks like Jon Gruden will be the next coach of the Oakland Raiders”. 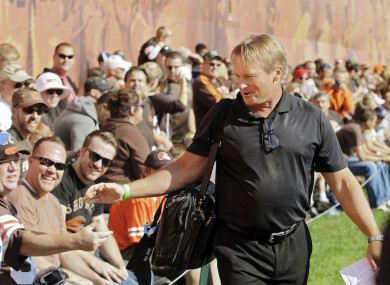 Feedback on “It looks like Jon Gruden will be the next coach of the Oakland Raiders”.